Within the hive there are different ways to communicate. Communication is done by vibration, the flower dance and most importantly pheromones. Off course pheromones would be useless without specific senses to react and respond to the pheromones. for example Bee antenna can tell temperatures difference of 0.5C, detect the difference between a full sister and half sister, detect humidity and C02 levels in the hive, it also contain hairs that can even measure wind speed. The inner workings of human being are regulated by hormones, and when we want to communicate with other people we use verbal and nonverbal language. For bees this is different, the honey bee can not speak and does not has sign language to communicate. Over the millions of years honey bees grew to something special known as a superorganism with a amazing complex social system. In honey bees, pheromones are the main part in communication between the queen, worker bee, drones and larvae. Through million of years the pheromones system grew to the enormous complexity we now observe within the hive. Each reaction which is triggered by the pheromone is different for each recipient. e.g. the drone react different to the queen pheromone than the workerbee. Within the hive there are around 15 different pheromones. And each task in the hive is regulated by different pheromones. A task is rarely signalled by one pheromone, often it is a cocktail from all the different pheromones available within a hive. The bee can also sense the pheromone on different ways, they can smell with there antenna’s or feel the pheromone/ signal with their mouth, feet and antennas. Pheromones are triggered by different situations and occurrences. below a short list with the most important pheromones. There are two types of alarm signals, one is from the mandibular glands which are located in the upper jaw of worker bees. the most important chemical for triggering a alarm response is methyl n-amyl ketone. when bees bite the intruder this also functions as a tranquilizer. After the intruder is numbed the bees throw them out of the hive. The second alarm pheromone is produced from the koschenivkov gland in workerbees. It contains up to 40 different flighty chemicals. The chemical is released when the stinger of the bee is exposed You will notice that it triggers other bees to behave aggressive as well. Sometimes when you wear gloves which endured a lot of stinging, bees keep being aggressive to it. To avoid this clean the gloves and clothing regularly. Note this pheromone is not the same as bee poison. The queen bee pheromone is a very complex cocktail of different chemicals. During the life of the queen bee the pheromone contains different proportions. There are 2 main pheromone groups categorized from the queen these are the Queen mandibular pheromone and the queen retinue pheromone. This pheromone has 4 main chemicals which are the 9-ODA, 9-HDA, HOB and HVA. There has been done a lot of research on the 9-ODA and the 9-HDA. Because the ratio of 9-ODA and 9-HDA is bigger it is easier to identify the effect of these chemicals. 9-ODA is produced in the upper jaw of the bee and inhibits the queen rearing. Also the 9-ODA depresses ovarian development in worker bees. 9-HDA has a stabilizing factor within the hive. it ensures the tranquility in the hive. Due to the complexity of the queen bee pheromone there is still a lot of research on going. At the start of the century 4 new chemicals have been identified in the queen pheromone. Above QMP was thought to have a retinue effect in bees. But the retinue effect can not only be described by the QMP. But the QMP is part of a larger cocktail of chemicals that ensures the retinue effect in bees. The new found chemicals are methyl oleate, coniferyl alcohol, cetyl alcohol and alpha-linolenic acid. These new found chemicals together with the QMP are now known as the queen retinue pheromone (QRP). In different stages of a queen bee life the queen bee pheromone regulates different tasks. It is the composition of the different chemicals which activates the different activities. For example in unfertilized queens there is less 9-HDA and HOB. The tergite is located on the back of the abdomen from the queen bee. This gland is part of the complex array of chemicals in the queen bee pheromone. Bees brush over this gland and distribute it further into the hive. This pheromone works in combination with the QMP pheromone from the upper jaw. The gland of the pheromone is based in the rear abdomen near the stinger. When the stinger is moved up, some pheromone is leaked. This occurs when the queen bee lays an egg in the cell. The pheromone is bee specific, so the worker bees can identify which eggs are laid by their queen and which are laid by worker bees. Worker bees have on the back side of their abdomen a gland which produces a pheromone that is specific for each hive. Normally bees stand on the entrance of the hive and put their abdomen high in the air. When they do this the Nasonov gland is exposed. During this pose the bee also fan their wings to spread the pheromone into the air (see photo). This activity is mostly done by multiple bees at once, it can also be called fanning. Bee fanning is an important activity. 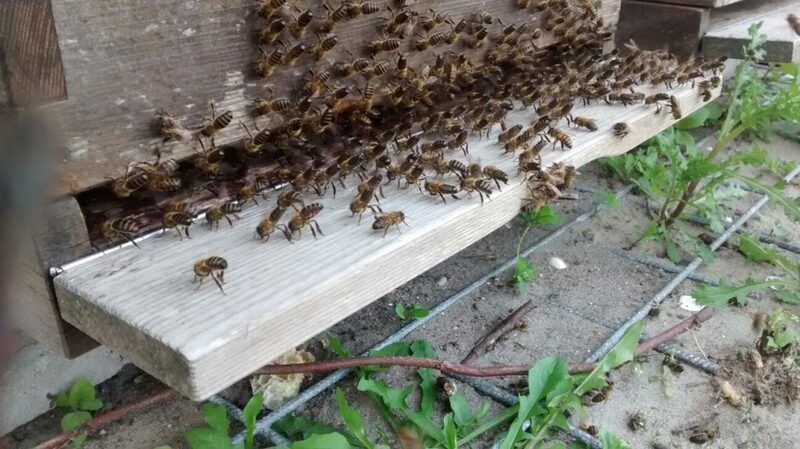 bees fan when the queen bee is on her propagation flight so bees fan for her to return safely into the hive. Also when young fourage bees have done their first flight bees fan so the bees can find the hive more easily. When bees find a safe drinking spot for water, bees start fanning at the water location. Because water has no scent the bees communicate to the other bees by fanning. Bees can also use their wings to regulate the temperature in the hive. But there is a slight distinction between regular ventilation and bee fanning. Bees whom ventilate the hive do not expose their gland by putting their abdomen high into the air. In the foot of the honeybee the arnhart gland is located. The chemical is walked through the hive and give the bees a scent. This scent works like a glue so the bees know where the majority in the hive is located. When a new brood chamber is located on the hive it can help to move 2 existing brood frames to the new brood chamber. The bees will accept the new brood chamber more easily. Is produced by the larvae in their salivary glands. This pheromone can suppress the stimulation for ovary growth in worker bees, which avoids egg laying worker bees. Bees which are exposed to this pheromone become nursing bees. If there is a lot of brood more pheromone is released and more bees will turn their activity to nursing the brood. Also this pheromone let the bees know the difference between worker bee larvae and drone larvae. Drone produce a type of pheromone in the first days of their lives in the hive (after hatching from the cells). They produce this pheromone in a gland in their head. all the pheromones which are made in only nine days are accumulated and used when the drones are at their congregation area. This pheromone is mainly used during flight. It is not sure if the drone larvae uses this pheromone to communicate with the workerbees. Foraging bees give this pheromone through trophallaxis (food transfer through mouth to mouth). This pheromone is produced in the honey stomach of the bee. When the pheromone is less available in the hive. More bees will start to forage. The biology of the queen bee and worker bees is for the large part the same. They consist of the same glands. But due to the metamorphosis of the queen bee she has some extraordinary capabilities normal worker bees lack. A queen bee can not consist on her own in the hive she needs the worker bees and the drones. As earlier mentioned they use pheromones and each pheromone can trigger a different response on the receiver. Below a short list on what role each pheromone can have on the different receiver. Queen mandibular gland (upper jaw): Oppresses queen cell building in the hive. / Oppresses ovarian development in worker bees./ stimulate foraging/ Attracts drones (9-ODA). / Activates nourishing bees queen. Bee poison gland: Focus signal for drones during propagation flight/ Worker bees during swarming. Dufour’s gland: Fertility sign for drones. / Marking off eggs. Koschevnikov gland: Activates nourishing bees/ attracts drones during propagation flight./ Concentrates the swarm. Tergite glands: part of the more complex QRP./ Stimulates genital mutilation of drones. / Gives direction for drones during propagation flight. Arnhart footprint glands: Part of the more complex QRP./ Distribution of hive scent. Mandibular gland (upper jaw): Alarm signal that trigger other workers to respond. Bee poison gland: Alarm signal that activates other workers to react aggressively. Dufour’s gland: This gland is activated when egg laying worker bees start laying eggs. Nasonov gland: Marks the hive entrance for other foraging bees. Arnhart footprint glands: Distribution of hive scent. The communication between bees is wonderfully complex. Which pheromones are triggered is dependent on the situation the bees face. Factors as food, stress, age and seasonal timing are all important. Difference in external factors triggers pheromone production in different glands to trigger the required response. The array of pheromones and the combination between them is endless. Pheromones also consist of many complex chemical compounds and all have their different function. There is still a lot to learn and research on this subject. Checklist Beesupplies - The right start! Aalstermethode - The Dutch Beekeeping Approach!